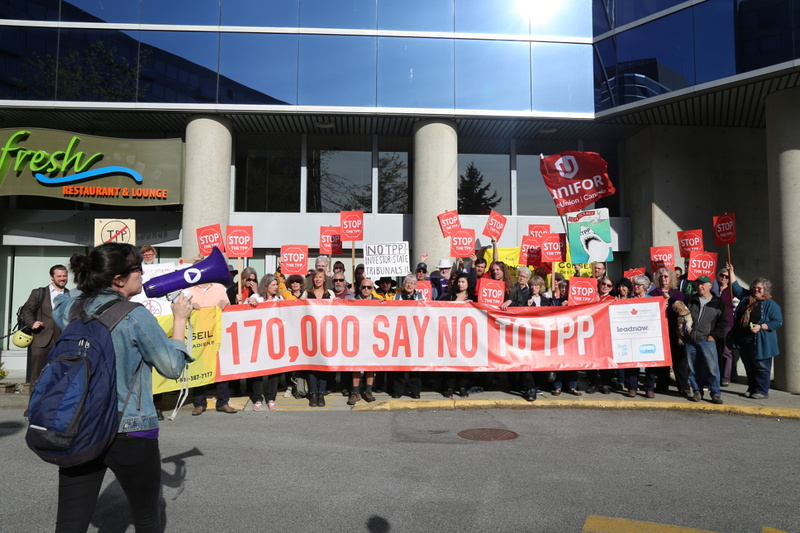 Members of the Leadnow community have articulated a progressive vision of a strong democracy, a fair economy and a clean environment, with an emerging focus on building solidarity with First Nations and migrant communities. We’ve done this by engaging with others through online trainings and community surveys, and face-to-face gatherings in cities and towns across the country. Here are just a few examples of how Leadnow’s member-driven model has worked. 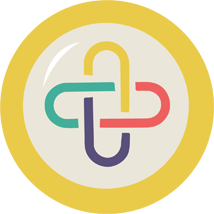 The Leadnow community can spring into action at the flip of a switch when there's a crisis or an opportunity for progress -- with massive online petitions and on-the-ground actions. Our rapid-response campaigning model has helped us win significant victories -- from blocking a coal mine that was trying to bypass climate rules, to defending Ontario's living wage incresaes from attacks by corporate lobbyists to convincing BC's Greens and NDP to work togetehr to overthrow the Christy Clark Liberals. Leading up to the October 2015 federal election, Leadnow ran its largest campaign ever - Vote Together. We had active field teams in 11 targeted ridings, and made recommendations in 29 key swing ridings - ultimately defeating the Conservatives in 25 of them. Across the country, nearly 100,000 people took our pledge to vote for the best local candidate to defeat the Harper Conservatives. The Vote Together website, with unprecedented local information on all 338 ridings, received over one million visits. 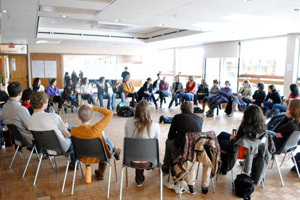 This online program explores the relationship between Indigenous Peoples and non-Indigenous Peoples in Canada and the ways in which we can build new relationships and work in solidarity on campaigns and issues that we care about. Through five modules, each with their own video panel and workbook, we encourage you to deepen your learning about our shared history and reflect on your role in creating a path forward. From February 27 - March 9, 2014, volunteer leaders hosted 80 events from coast to coast to coast to begin creating a shared vision for change, and building a foundation for action in the 2015 election and beyond. 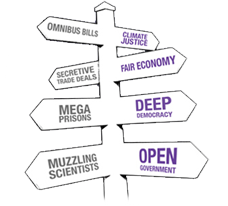 Again and again, we heard from people who are excited about connecting with others in their communities, and about a national plan for action that focuses on working across party lines towards an open democracy, fair economy and safe climate. Our Moment was a live-streamed discussion held in November 2013. It was an opportunity to share our plans for 2015 and beyond with the Leadnow community and hear feedback and answer questions in real time. Leadnow staff embarked on a 10-city tour of Canada in the spring of 2013 offering workshops and meeting with the amazing people in the Leadnow community. The workshops focused on developing powerful communication and personal leadership skills while learning about effective action planning and new social media strategies that anyone can use. 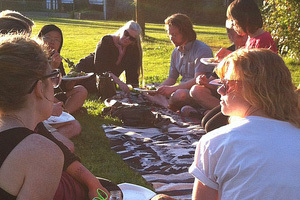 Summer Gatherings were organized by volunteers in 2012 to connect pro-democracy Canadians in our communities, share our stories, and prepare to organize a national conversation to build the pro-democracy movement Canada urgently needs. 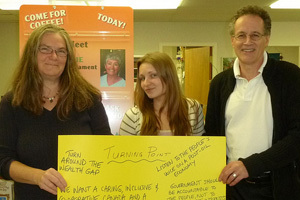 Turning Point was a week of cross-Canada gatherings that took place in September 2011. The events brought together generations of Canadians to organize for change, and send a message to Ottawa that more and more Canadians are stepping up to shape our shared future. We are came together at these gatherings because we believe that our country is heading in the wrong direction, and we share a desire to create a turning point for Canada. Over three weeks in March 2011 people from across the country came together in over 75 local get-togethers to talk about their hopes and goals for Canada. 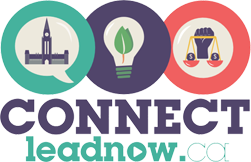 The get-togethers were part of a larger process organized by Leadnow to craft a Declaration for Change that was then used to call on federal politicians to cooperate for progress on issues people care about. Canadians backed the declaration with a commitment to vote for the politicians who would rise to the challenge.